Karlsson’s Gold is the opposite of modern “left-overs” Vodka. Like a lot of specialty spirits throughout history, Karlsson’s Vodka started with a bunch of farmers. In this case, a group of potato farmers that specialized in a gourmet “Virgin New” potatoes from Cape Bjäre, Sweden, were being crowed out by cheaper imports. So they banded together and made their own market by finding Börje Karlsson — the master distiller who had a hand in creating Absolute years ago. After tinkering a few years they launched Karlsson’s Vodka, bringing real Swedish potato Vodka back to the market for the first time in years. Most Vodkas are tragically abused — being distilled multiple times and then filtered to get all of the flavour out. That’s because — most of the time — the base grain material is left-over from other food or spirits production and starts off at a very low quality. Karlsson’s Gold Vodka starts with some of the best potatoes in the world, so it's only distilled once and bottled without filtering to preserve the creamy texture that comes naturally to a high quality potato spirit in the classic Swedish style. 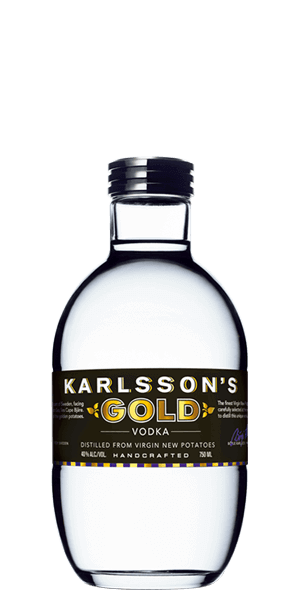 What does Karlssons Gold Vodka taste like? The Flavor Spiral™ shows the most common flavors that you'll taste in Karlssons Gold Vodka and gives you a chance to have a taste of it before actually tasting it. Peppery and vanilla. Great neat over ice. This was an interesting vodka, it has a nearly floral subtle flavour. I will be purchasing again. I used this straight, on the rocks, and in a vodka soda and had some raving reviews from party members. Maybe others like it, but it wasn't my favorite. I prefer a Vodka that is willing to play nicely with my Fever Tree Tonic. While I don't mind a strong voice from my libation, as I often drink it straight, this seemed to clash with my tonic. Maybe, I'll only drink it straight?